Fans weren't the only ones bummed to see Captain Cold's demise on Legends of Tomorrow. 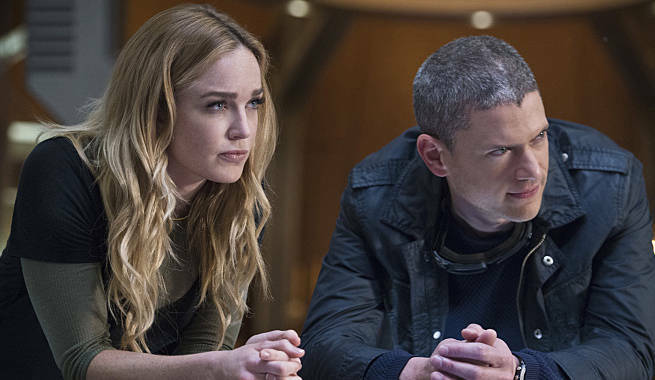 Actress Caity Lotz told Comicbook.com at the CW upfronts in NYC this week that she too was hoping to further explore the budding friendship and relationship between her character, Sara "White Canary" Lance and Leonard "Captain Cold" Snart, as played by Wentworth Miller. "I was hoping to explore it more, for sure. It was very heart-breaking the way that it happened, which of course is good, too," she said, noting that at least he got a good story moment. "I’ve been traveling and meeting a lot of fans, and everybody was so excited about the ‘Captain Canary’ stuff, so I hated the fact that it’s like, ‘well we’re gonna give it to you then take it away!’ It’s a cool dynamic together, and I love working with Wentworth, so I’m bummed," Lotz said. The actress did tease a little bit of hope, saying, "But we haven’t seen the last of him." Whether that's just the little moments like we got in the season finale, or some possible future for him being on the team once more is anyone's guess, though. Lotz said she's looking forward to more surprises in season two, and that she hopes to play a little more of the lighter side of Sara. “It’s interesting, and I love seeing what they’re going to come up with in the writing," the actress said. "You never know where it’s going to go, so sometimes you get an episode and it’s like ‘Woah! I did not see that coming!’ which is totally fun. Transitioning onto Legends was interesting because it has a different tone than Arrow. It’s been nice having that levity for her." As for the bloodlust her character reawakened with from the Lazarus Pit, as far as she knows, it's gone. "I think in the episode that she goes to Nanda Parbat, that’s what they really addressed, that Ra’s al Ghul is able to help her with. She deals with it there," Lotz explained. There's always a possibility that the dark side of the White Canary could re-emerge, though. "I guess you never know, if it’s something that’s fully cured or just like a virus that sits dormant in your body, but we’ll see!" Legends of Tomorrow returns to The CW Thursdays at 8pm this Fall.